Summary: Roberta 'Bobbie' Brown is not the kind of person who believes in ghosts. A Halloween dare at her ridiculously spooky boarding school is no big deal, especially when her best friend Naya and cute local boy Caine agree to join in too. They are ordered to summon the legendary ghost of 'Bloody Mary', say her name five times in front of a candlelit mirror, and she shall appear...but, surprise surprise nothing happens. Review: I had heard so much about James Dawson but had never had a chance to discover his writing before 'Say Her Name'. This may have been the first novel I devoured but I can safely say it will not be the last. I am definitely a fan of his work. Having listened to James read from 'Say Her Name' at the Hot Key's blogger event I was instantly intrigued, and I done the one thing I am usually good at avoiding. I temporarily ditched my current book. I can't say I've read a great deal of horror since the Point Horror books at school and I generally am not one for scaring myself to be honest. But James had made me want to read about Bobbie and co after his intriguing read. So that is exactly what I did. If I'm honest if I had started this on a day off I imagine I could have devoured it in one sitting. James truly has a way with words, I'm a little upset with myself as I had written a chunk of my review and it didn't save and now I no longer have the note paper. Anyway, sorry about that Bobbie has such a distinctive voice. Although I really do not understand why she gets tormented by a number of her peers, I would've befriended Bobbie. So to prove she's not a wet weekend Bobbie daringly agrees to call for Bloody Mary at a Halloween get together with some members of her school and some boys. Yup! cute boys are always a weakness for us girls and I can safely say I would've fallen along with Bobbie over Caine. Everything about Bobbie screams fun and everything about Caine screams dreamboat. I loved getting to know the characters as this creepy tale took over, but more importantly I loved the relationship that blossomed between Bobbie and Caine especially when things got tough and unexplainable disappearances were happening. What I truly love is that now thanks to social media readers can interact with each other and the authors in question as we are reading. James really did make me laugh by daring me to read at night. I remember vividly I was compelled by the story and fully focused whilst sitting on the bus home one night after work and I swear something touched my shoulder and there was nothing there. It's safe to say I was a little freaked but 'Say Her Name' sucked me in so much that I honestly couldn't stop reading even if I'd tried to. 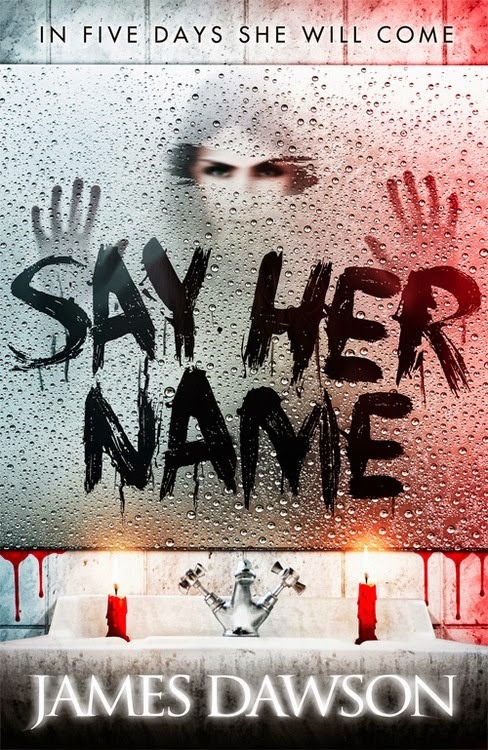 If you want to read something fun, different and a tad creepy then do yourself a favour and get a copy of Say Her Name...but the real question is DO YOU DARE! Brilliant review - I really hope we get a sequel!